Since Microsoft XP released Service Pack 2, the Lake.class applet will not work correctly! In the instructions below, replace the Lake with lake! 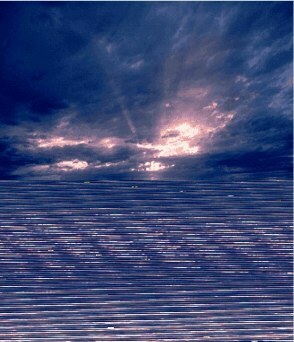 NOTE: this page will take some time to load! Looking for a way to reflect an animated image? that goes with it to work in Trellix/CSB. Important note: This tutorial was originally made with Lake.class not lake.class! The capital L matters! 2. Use the code ABOVE instead of the code shown in step 2, just changing the image size and name. 3. FTP your image and class file to your site. Use a photo program to check pixel size. Width stays the same. 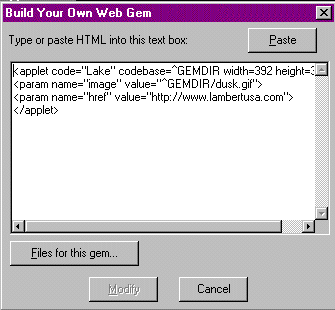 CSB User: Insert > HTML is same as Trellix Webgem! CSB User: still use ^GEMDIR in code! 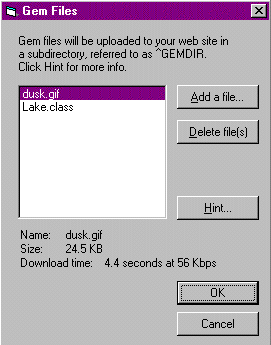 CSB User: Files for this component is same as Gem Files! Make sure capitalization is same as you used in the code (step 2)! This step eliminates the need to FTP your files to your site! NOTE: if you are NOT using CSB or TRELLIX to build your site, use his code, and FTP your image and class file to your site! Use any photo and add/replace water! This sample was made for USSRankin website and used with permission.